The Mt. Taylor Ranger District is comprised of two mountain ranges, Mt. Taylor and the Zuni Mountains, totaling nearly 520,000 acres of National Forest land. Elevations range from 6,500 to 11,301 feet. Mt. Taylor is an area of special religious and cultural significance to several Native American communities. Mt. Taylor and the Zuni Mountains are rich in cultural resources including many historic sawmills and logging community sites and logging railroad beds. The Mt. Taylor Ranger District office is located in Grants. The Grants area, like much of New Mexico is rich in history. 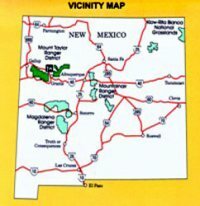 The Cibola National Forest map of the Mount Taylor Ranger District contains the latest recreation and travel information to guide you through this area. The map is printed on waterproof, tear-resistant paper, contains shaded relief and is at a scale of 1/2 inch to the mile. For more information, all the ranger district offices’ and related agencies’ numbers are easily found.